Why are the answers out of order now? Accepted answer first followed by non-accepted answers in decreasing order of score. However, now it seems to use time of answer to order the answer. For instance in this question my answer was first and has the highest score but appears (for me) at the bottom of the list of answers. If you sorted by oldest yours would be listed first as well. When sorting by active instead, your post is sorted last. Your sort preference is persisted; if you picked a different sort order on a different question, then until you change the setting, all question pages will use that sort order. This applies to just most 'tab' options on the site; the big exception I can think of is the search results (which sort by relevancy instead). Keep that in mind when results are unexpected, like no questions for a popular tab because you picked the 'featured' tab while there are no bountied questions for that tag at that time. If you have the keyboard shortcuts preference enabled, it'll be relatively easy to accidentally change the sort order; all it takes is typing O-A or O-O to switch to Active or Oldest sort order, respectively. Type in O-V to go back to sorting by votes. Not the answer you're looking for? 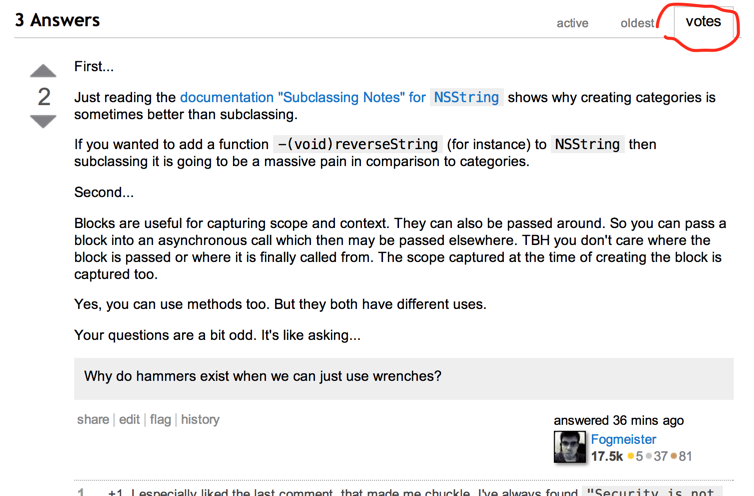 Browse other questions tagged support answers upvotes sorting . something wrong with answer sorting? Why is the answer with most vote by far ( 52 ) shown as the last answer? Why aren't most voted answers displayed first? Answer order why is a +69 answer below a +2 answer? How is this answer with 1 vote positioned above an answer with more than 1? What is the sort/display order going from top to bottom of answers on SO? Why are accepted answers more prominent than answers with more votes? Why aren't answers of equal score displayed chronologically? In a search query, what are the possibilities to sort the results?